Regardless of how simple your DIY roof repair may seem, it can still be dangerous if you aren't careful and observe proper safety measures. Be sure to prepare for the job and keep these tips handy. Wear Proper Footwear - To avoid slipping on your roof surface or shingles, choose a pair of rubber-soled work shoes or boots. Make sure it has good tread so you don't slip. Slow and Steady - Don't rush or be in a hurry to complete your repair. Most accidents and injuries occur when someone is rushing to finish a DIY job. Be sure to take breaks, especially if the weather is hot. Get Up On Your Roof Safely - Invest in a sturdy extension ladder that extends at least 3 feet above your roof's edge. Fiberglass ladders offer the best protection against electrocution. Set your ladder firmly on even ground or if your ground is not even, place plywood squares under one foot to level your ladder base, then secure with a wire or rope tied to stakes. Make sure to also secure the top of your ladder with a secure anchor point to keep it from sliding. Prepare Your Tools and Supplies - Make a list of what tools you will need for the job while you're still on the ground. Get them ready and be careful when you bring it over to your roof. It's best to create a pulley system to transport your tools up to your roof and avoid carrying anything up the ladder. 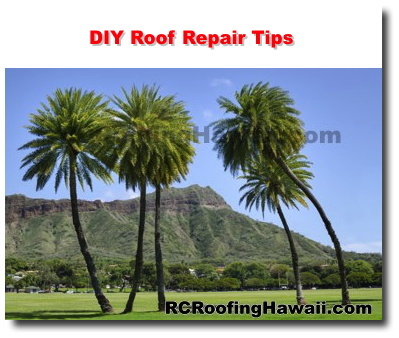 Know When It's Time For Pros to Come In and Help - If you realize that the project would need professional help, or are unsure about climbing on your roof, don't hesitate to call a professional to help you. Contact us at R&C Roofing Contractors for a no obligation roof inspection. With over 50 years of combined roofing experience, our team can help inspect and repair your roof and help keep you safe!